As part of a daylong programme of commemoration, celebration, and culture on the day before the centenary of Armistice Day, Florian Kaplick will perform a concert of works composed by Debussy in the shadow of World War I, including his celebrated ballet music La boîte à joujoux. The year 2018 is not only the centenary of the World War I Armistice, but also of the death of Claude Debussy, one of France’s most eminent composers of all times. To celebrate peace and friendship between nations, this concert brings together a German pianist with his passion for French music in a venue on British ground. When at midnight the clock’s last stroke settles into silence and all living things are soundly asleep, life begins for those who have spent the whole day in their cramped toy box: dolls, puppets, polichinellos, and soldiers find their loves and wage their wars. The second part focuses on piano pieces Debussy wrote during the time of war until his death in March 1918: Berceuse héroique, Pour l’oeuvre du "Vêtement du blessé", Élégie, Pour un tombeau sans nom and Debussy’s only recently discovered very last composition Les soirs illuminés par l’ardeur du charbon. Florian Kaplick trained as a musician in Nuremberg at the Meistersinger-Konservatorium of music. He is a versatile performer, able to express his varied artistic interests as a pianist, conductor, reciter, and Dadaist at home and abroad. Claude Debussy is a French composer who straddled the 19th and 20th centuries. 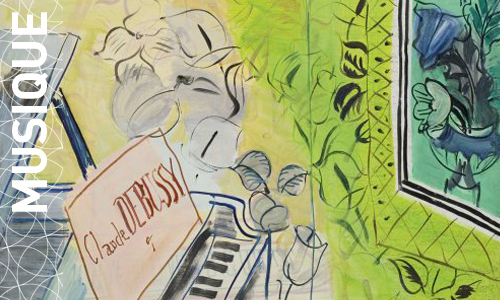 Known as a free-spirited and noncomformist musician, Debussy was often characterised as a musical impressionist, a label he never accepted. His music is most notable for its chromatic liberty and the attention given to selecting each instrument’s timbre. For more information on Debussy, please refer to this video created by our neighbour, the National Library of Scotland, in commemoration of the centenary of his death.